Seal oil cantinas three essential Omega 3 fatty acids: EPA, DHA and DPA. Unlike fish oil, seal oil contains exceptionally high levels of DPA. Our seal oil also cantinas squalene and Vitamin E, making it excellent Omega3 supplement for health and well being. Seal oil 500mg, Vitamin E 10mg, Squalene 10mg, Encapsulating Aids. No artificial flavorings, preservatives added. Scientists have recently found out that oil extracted from the flesh of seal is one of the best and complete sources of omega 3 polyunsaturated fatty acids. This is because researchers have found a link between the low number of Eskimos in Inuit that have heart disease or cancer. The main different that was noted in their diets is the intake of seal oil and fish. Therefore seal oil is considered a great source of Omega 3. Seal oil not only contains EPA and DHA in considerable amounts, but also another important fatty acid – DPA. DPA is found in human milk in high concentration and therefore it is very important for the growth and development of the baby. Let’s find out more about seal oil omega 3 supplements. Fatty acids found in seal oil capsules are helpful in controlling inflammation and Rheumatoid Arthritis. Other known health benefits provided by seal oil are prevention of cardiovascular disease, hypertension and diabetes. Seal is a mammal and oil extracted from it is fit for consumption by humans. Its structure is a little different than fish oil and there are no side effects associated with its consumption. Seal oil is easily digestible by the stomach and people who have problems in digesting heavy medicines can use it as an alternative. Seal oil in also helpful in the treatment of multiple sclerosis, breast cancer and Alzheimer’s disease. 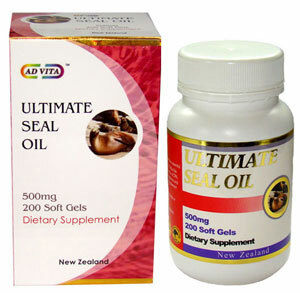 Pregnant women are strongly recommended to increase their daily intake of seal oil. Fatty acids, especially DPA, are responsible for a healthy pregnancy and normal weight of the baby. There are many similarities between seal oil and fish oil. Both contain enough Omega 3 fatty acid that it can help with lowering blood pressure, high cholesterol, reduce the risk of heart disease and stroke, boost the immune system, assist with brain functioning, reduces the chances of depression, assists with bipolar disorder, and can prevent cancer and arthritis. However, seal oil offers less Omega 6 fatty acid than either fish or flax seed oils. This means it works better for restoring the balance between Omega 3 and Omega 6 fatty acids that isn't done naturally due to your diet. Omega 6 is essential for your physical and mental health but most people eat a diet that provides them with too much Omega 6 and not enough Omega 3, leading to health concerns and even diseases. Most fish oils only have two main ingredients of Omega 3 -- EPA and DHA, but seal oil has the benefit of the third ingredient -- DPA. Seal oil is the best supplement for getting the right amount of Omega 3 fatty acids while working to help balance the amount against the Omega 6 in the body. It also is safe enough for infants and young children to benefit from. A pilot study, published in 2002(Arslan et al. 2002), examined the effect of giving seal oil to 10 patients suffering from inflammatory diseases (IBD, chronic inflammatory disease, ulcerative colitis, and Crohns disease) and joint pain. When given seal oil (10 ml, 3 times a day) for 10 days via a (nasoduodenal) tube into the small intestine, the patients reported an amelioration of their joint pains. However, the intestinal symptoms were only slightly improved. The treatment was repeated for five of the patients at a later stage, and they were examined by a rheumatologist before and after the treatment, confirming that the joint pain was reduced. The results of Arslan’s pilot study were confirmed through a controlled study published in 2004 (Bjørkkjær et al. 2004). Here, 19 IBD patients with joint pain got the same treatment with seal oil or soy oil for 10 days through a nasoduodenal tube, and were followed up for 6 months after the treatment by a rheumatologist. During the study period the patients receiving seal oil claimed improvement of their joint pain compared to the patients given soy oil. The effect of the seal oil lasted up to several months after the treatment.